This article is about the Thomson Reuters Corporation. For the Thomson Reuters Foundation, see Thomson Reuters Foundation. Thomson Reuters Corporation (/ˈrɔɪtərz/) is a Canadian multinational mass media and information firm. 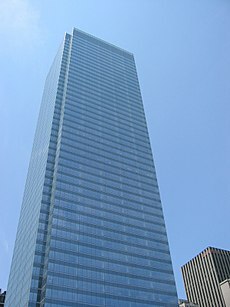 The firm was founded in Toronto, Ontario, Canada, where it is headquartered at 333 Bay Street in Downtown Toronto. Thomson Reuters shares are cross listed on the Toronto Stock Exchange (TSX: TRI) and the New York Stock Exchange (NYSE: TRI). The company was founded by Roy Thomson in 1934 in Ontario as the publisher of The Timmins Daily Press. In 1953, Thomson acquired the Scotsman newspaper and moved to Scotland the following year. He consolidated his media position in Scotland in 1957 when he won the franchise for Scottish Television. In 1959, he bought the Kemsley Group, a purchase that eventually gave him control of the Sunday Times. He separately acquired the Times in 1967. He moved into the airline business in 1965, when he acquired Britannia Airways and into oil and gas exploration in 1971 when he participated in a consortium to exploit reserves in the North Sea. In the 1970s, following the death of Thomson, the company withdrew from national newspapers and broadcast media, selling the Times, the Sunday Times and Scottish Television and instead moved into publishing, buying Sweet & Maxwell in 1988. The company at this time was known as the International Thomson Organisation Ltd (ITOL). In 1989, ITOL merged with Thomson Newspapers, forming The Thomson Corporation. In 1996, The Thomson Corporation acquired West Publishing, a purveyor of legal research and solutions including Westlaw. The Company was founded by Paul Julius Reuter in 1851 in London as a business transmitting stock market quotations. Reuter set up his "Submarine Telegraph" office in October 1851 and negotiated a contract with the London Stock Exchange to provide stock prices from the continental exchanges in return for access to London prices, which he then supplied to stockbrokers in Paris, France. In 1865, Reuters in London was the first organization to report the assassination of Abraham Lincoln. The company was involved in developing the use of radio in 1923. It was acquired by the British National & Provincial Press in 1941 and first listed on the London Stock Exchange in 1984. 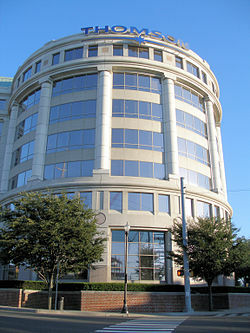 Reuters began to grow rapidly in the 1980s, widening the range of its business products and expanding its global reporting network for media, financial and economic services: key product launches included Equities 2000 (1987), Dealing 2000-2 (1992), Business Briefing (1994), Reuters Television for the financial markets (1994), 3000 Series (1996) and the Reuters 3000 Xtra service (1999). The Thomson Corporation acquired Reuters Group PLC to form Thomson Reuters on April 17, 2008. Thomson Reuters operated under a dual-listed company (“DLC”) structure and had two parent companies, both of which were publicly listed — Thomson Reuters Corporation and Thomson Reuters PLC. In 2009, it unified its dual listed company structure and stopped its listing on the London Stock Exchange and NASDAQ. It is now listed only as Thomson Reuters Corporation on the New York Stock Exchange and Toronto Stock Exchange (symbol: TRI). On February 13, 2013, Thomson Reuters announced it would cut 2,500 jobs to cut cost in its Legal, Financial and Risk division. On October 29, 2013, Thomson Reuters announced it would cut another 3,000 jobs, mostly in those same three divisions. The Thomson-Reuters merger transaction was reviewed by the U.S. Department of Justice and by the European Commission. On February 19, 2008, both the Department of Justice and the Commission cleared the transaction subject to minor divestments. The Department of Justice required the parties to sell copies of the data contained in the following products: Thomson's WorldScope, a global fundamentals product; Reuters Estimates, an earnings estimates product; and Reuters Aftermarket (Embargoed) Research Database, an analyst research distribution product. The proposed settlement further requires the licensing of related intellectual property, access to personnel, and transitional support to ensure that the buyer of each set of data can continue to update its database so as to continue to offer users a viable and competitive product. The European Commission imposed similar divestments: according to the Commission's press release, "the parties committed to divest the databases containing the content sets of such financial information products, together with relevant assets, personnel and customer base as appropriate to allow purchasers of the databases and assets to quickly establish themselves as a credible competitive force in the marketplace in competition with the merged entity, re-establishing the pre-merger rivalry in the respective fields." These remedies were viewed as very minor given the scope of the transaction. According to the Financial Times, "the remedy proposed by the competition authorities will affect no more than $25m of the new Thomson Reuters group’s $13bn-plus combined revenues." The transaction was cleared by the Canadian Competition Bureau. In November 2009, The European Commission opened formal anti-trust proceedings against Thomson Reuters concerning a potential infringement of the EC Treaty's rules on abuse of a dominant market position (Article 82). The Commission investigated Thomson Reuters' practices in the area of real-time market datafeeds, and in particular whether customers or competitors were prevented from translating Reuters Instrument Codes (RICs) to alternative identification codes of other datafeed suppliers (so-called 'mapping') to the detriment of competition. In December 2012, the European Commission adopted a decision that renders legally binding the commitments offered by Thomson Reuters to create a new licence ("ERL") allowing customers, for a monthly fee, to use Reuters Instrument Codes (RICs) in applications for data sourced from Thomson Reuters' real time consolidated datafeed competitors to which they have moved. Historically, no single individual has been permitted to own more than 15% of Reuters, under the first of the Reuters Principles, which states, "Reuters shall at no time pass into the hands of any one interest, group or faction." However, that restriction was waived for the purchase by Thomson, whose family holding company, the Woodbridge Company currently owns 53% of the enlarged business. Robert Peston, business editor at BBC News, stated that this has worried Reuters journalists, both because they are concerned that Reuters' journalism business will be marginalized by the financial data provision business of the combined company, and because of the threat to Reuters's reputation for unbiased journalism by the appearance of one majority shareholder. Pehr Gyllenhammar, chairman of the Reuters Founders Share Company, explained that the Reuters Trust's First Principle had been waived for the Thomson family because of the poor financial circumstances that Reuters had been in, stating, "The future of Reuters takes precedence over the principles. If Reuters were not strong enough to continue on its own, the principles would have no meaning." He stated, not having met David Thomson but having discussed the matter with Geoff Beattie, the president of Woodbridge, that the Thomson family had agreed to vote as directed by the Reuters Founders Share Company on any matter that the trustees might deem to threaten the five principles of the Reuters Trust. Woodbridge will be allowed an exemption from the First Principle as long as it remains controlled by the Thomson family. The chief executive of the combined company is James C. Smith, who was the chief executive for the professional division, and the chairman is David Thomson. As of 2018, the Financial & Risk division makes for over half of the company's revenue. Thomson Reuters competes with Bloomberg L.P., in aggregating financial and legal news. Between 2008 and 2018, Thomson Reuters completed over 200 acquisitions. In July, Thomson Reuters acquired Streamlogics. Founded in 1999, Streamlogics is a provider of customizable, high volume, real time data mining solutions  for hundreds of enterprises across several verticals including financial services, technology and health care/life sciences. Streamlogics' webcasting solutions are used for training and certification, marketing and lead generation, and corporate communications. In August, it bought Vhayu Technologies. Vhayu is a provider of tick data services, and Thomson Reuters had been distributing its Velocity product under the Reuters Tick Capture Engine label for the four years prior to the acquisition. On September 21, 2009, Thomson Reuters bought Hugin Group, the European IR and PR distribution group, from NYSE Euronext. Terms have not been disclosed, but it has been reported in Danish newspapers that the price was between €40 million and €42m. In September, it also bought the Abacus software business from Deloitte, a provider of corporate taxation software for the U.K., Ireland, the Netherlands, New Zealand, and Hong Kong, as well as Indirect Tax Reporting software for 20 E.U. countries. Terms of the transaction were not disclosed. In November, The Tax & Accounting business acquired Sabrix, Inc, a global provider of transaction tax management software applications and related services. In February, Thomson Reuters acquired Aegisoft LLC to improve their electronic trading capabilities by offering direct market access. Also in February, it acquired the legal ranking system Super Lawyers. In May, it acquired Point Carbon A/S, a Norwegian company that provides news and trading analytics for the energy and environmental markets. In June, it acquired Complinet, a compliance software company. In October, it acquired Serengeti Law, a matter management and ebilling system. On November 22, it acquired the legal process outsourcing (LPO) provider Pangea3. Financial Terms of the deal were not disclosed. In November, it also acquired the banking data and analytic provider Highline Financial, and GeneGo, a supplier of systems biology databases, software and services. On 20 June 2011, Thomson Reuters acquired CorpSmart from Deloitte. On July 18, 2011 Thomson Reuters acquired Manatron from Thoma Bravo. In August 2011, Thomson Reuters acquired GFMS. In December 2011, Thomson Reuters acquired Emochila, a website development firm founded by Chad Brubaker and Justin Curzi in the tax and accounting space, in order to further integrate its CS suite of products onto a cloud-based platform. In January 2012, Thomson Reuters acquired Dr Tax, Canada’s largest independently owned developer of income tax software for accounting firms and consumers. In February 2012, Thomson Reuters acquired RedEgg, a provider of media intelligence solutions for public relations and marketing professionals. On 8 June 2012, Thomson Reuters acquired Apsmart, a London-based company specializing in design and development of mobile solutions. On 25 June 2012, Thomson Reuters acquired Zawya Limited, a regional provider of business intelligence and unique tools for financial professionals in the Middle East and North Africa . On 10 July 2012, Thomson Reuters acquired FX Alliance Inc, an independent provider of electronic foreign exchange trading solutions to corporations and asset managers. On 26 July 2012, Thomson Reuters announced acquisition of MarkMonitor, a San Francisco-based company specializing in internet brand protection software and services. On January 3, 2013, Thomson announced that it was to acquire Practical Law Company, the London-based provider of practical legal know-how and workflow tools to law firms and corporate law departments. Practical Law Company has more than 750 employees, with principal operations in London and New York, and will be part of the Legal business of Thomson Reuters. On 16 April 2013, Thomson Reuters acquired Select TaxWorks Assets of RedGear Technologies. On 6 June 2013, Thomson Reuters acquired Pricing Partners, a provider of OTC Derivatives Pricing Analytics and independent valuation. On 2 July 2013, Thomson Reuters acquired the foreign exchange options business of Tradeweb. On August 16, 2013, Thomson Reuters acquired the foreign exchange options risk management technology provider SigmaGenix. In August, it also acquired WeComply. On September 10, 2013, Thomson Reuters acquired the CPE and CPA Division of Bisk Education Inc  and Kortes. On October 23, 2013, Thomson Reuters acquired Entagen, acquiring the Cortellis family of products for drug pipeline, deals, patents, and company content. On December 10, 2013, Thomson Reuters acquired Avedas and expands its scholarly-research analytics solution. In February, Thomson Reuters acquired Brazil's Domínio Sistemas, a company focused on developing accounting solutions. On July 1, 2014, Thomson Reuters acquired UBS Convertible Indices. In October, Thomson Reuters sold its PE/VC media assets (including PEHub and Venture Capital Journal) to UCG. In January, Thomson Reuters acquired K'Origin. In September, Thomson Reuters acquired Business Integrity Ltd. In April, Thomson Reuters acquired Wm Reuters Foreign Exchange benchmarks from State Street Corporation. In July, Thomson Reuters announced it would be selling its Intellectual Property and Science business (including Web of Science, MarkMonitor and EndNote) to private equity funds. The newly independent business is Clarivate Analytics. In January 2018, Thomson Reuters announced it was divesting its financial and risk unit to US private equity firm, the Blackstone Group. Thomson Reuters will retain 45% of the divested unit, keep the Reuters brand and will continue to deliver Reuters news and editorial content to the new divested unit. The joint venture will be branded as Refinitiv. The deal will fund the Reuters business for the next 30 years. David Thomson is said to oppose the deal, and the transaction was approved by the EU commission on July, 23, 2018. In October 2018, Thomson Reuters announced to acquire Integration Point, an international leader in global trade management (GTM) operations. Thomson Reuters has sponsored Canadian golf champion Mike Weir and the AT&T Williams Formula One team. It also sponsors Marketplace, a radio show from American Public Media. Thomson Reuters, among other media corporations, also donated hundreds of thousands of dollars to the Clinton Foundation. ^ a b c d e "2016 Annual Report Regulatory Filing". Thomson Reuters. Retrieved August 4, 2017. ^ a b "About Us". Thomson Reuters. Retrieved April 20, 2013. ^ "Thomson Reuters CEO to move to Toronto, launches tech center". Reuters. Retrieved September 7, 2017. ^ Haycock, Gavin; MacMillan, Robert (April 17, 2008). "Thomson Reuters debuts amid global market jitters". Reuters. Retrieved April 18, 2008. ^ " "Archived copy" (PDF). Archived from the original (PDF) on August 21, 2010. Retrieved August 5, 2010. CS1 maint: Archived copy as title (link)." Interbrand. Retrieved on August 5, 2010. ^ "Thomson completes acquisition of Reuters". Thomson Reuters. Retrieved January 15, 2014. ^ "Thomson Reuters Cutting 3,000 Jobs". The Wall Street Journal. October 29, 2013. Retrieved October 30, 2013. ^ "Justice Department Requires Thomson to Sell Financial Data and Related Assets in Order to Acquire Reuters". US Department of Justice. February 19, 2008. Retrieved January 15, 2014. ^ "EUROPA – Rapid – Press Releases". EUROPA. Retrieved January 15, 2014. ^ Edgecliffe, Andrew (February 19, 2008). "/ Companies / Media & internet - Thomson cleared for Reuters merger". Financial Times. Retrieved January 15, 2014. ^ "Competition Bureau Clears Thomson Acquisition of Reuters". Competition Bureau. Retrieved January 15, 2014. ^ "Commission opens formal proceedings against Thomson Reuters concerning use of Reuters Instrument Codes". European Commission. 2009. ^ "Antitrust: Commission renders legally binding commitments from Thomson Reuters". European Commission. 2012. ^ Andrew Edgecliffe-Johnson (May 16, 2007). "Thomson accepts Reuters voting code". Financial Times. The Financial Times Ltd.
^ "Thomson accepts Reuters voting code". Financial Times. eFinancialNews Ltd. May 17, 2007. ^ Kevin Bell and Joe Schneider (May 16, 2007). "Thomson Emerges From Father's Shadow With Reuters Buy". Bloomberg L.P.
^ "Thompson Reuters Fact Book 2014". Thompson Reuters. Archived from the original on July 2, 2017. ^ a b c "Exclusive: Blackstone in talks to buy majority stake in key Thomson Re". Reuters. January 30, 2018. Retrieved January 30, 2018. ^ White, Aoife; Bodoni, Stephanie (February 13, 2014). "Thomson Reuters EU Antitrust Pact Challenged by Morningstar". Bloomberg.com. Retrieved May 5, 2014. ^ Information Today (July 9, 2009). "Thomson Reuters Acquires Streamlogics". Information Today, Inc. Retrieved January 15, 2014. ^ Press Releases. Thomson Reuters (2013-06-30). Retrieved on 2013-08-17. ^ "Thomson Reuters Acquires Breaking Views" (Press release). ^ "Thomson Reuters To Acquire Sabrix. Terms of the transaction were not disclosed". Taume News. October 17, 2009. Archived from the original on June 7, 2011. Retrieved October 17, 2009. ^ "Thomson Reuters Acquires Discovery Logic" (Press release). ^ "Talari Product Page". abajournal.com. February 2, 2010. Retrieved October 1, 2018. ^ MacMillan, Robert (May 27, 2010). "Thomson Reuters to buy Norway's Point Carbon". Reuters. ^ "Thomson Reuters Acquires Complinet" (Press release). ^ "Thomson Reuters Acquires Pangea3". prnewswire. Retrieved November 22, 2010. ^ "Thomson Reuters Acquires GeneGo". Thomson Reuters. Retrieved January 15, 2014. ^ Thomson Reuters (June 20, 2011). "acquires CorpSmart". ^ Thomson Reuters (July 18, 2011). "Thomson Reuters Completes Acquisition of Manatron". Archived from the original on September 24, 2015. ^ Cohn, Michael. "Thomson Reuters Acquires Web Designer Emochila". Accounting Today. Retrieved January 15, 2014. ^ "Press releases". Thomson Reuters. Retrieved January 15, 2014. ^ "Thomson Reuters announces acquisition of Dr Tax Software Inc". Dr Tax. Retrieved January 15, 2014. ^ "Thomson Reuters Acquires Bizactions" (Press release). ^ "Acquires Apsmart". Thomson Reuters. June 8, 2012. Retrieved February 14, 2013. ^ "Acquires Zawya". Thomson Reuters. June 25, 2012. Retrieved June 25, 2012. ^ "Thomson Reuters Agrees to Acquire FX Alliance Inc. (FXall)" (Press release). July 9, 2012. Retrieved July 30, 2012. ^ "Thomson Reuters Acquires DoFiscal" (Press release). ^ "Thomson Reuters to Acquire MarkMonitor" (Press release). July 26, 2012. Retrieved July 27, 2012. ^ "Thomson Reuters to Acquire Practical Law Company | Thomson Reuters". thomsonreuters.com. Retrieved May 11, 2016. ^ "Thomson Reuters Acquired select assets of the TaxWorks software line from RedGear technologies" (Press release). April 16, 2013. Retrieved April 16, 2013. ^ "Thomson Reuters Acquired Pricing Partners" (Press release). June 6, 2013. Retrieved June 6, 2013. ^ "Thomson Reuters has agreed to buy the foreign exchange options business of Tradeweb Mark" (Press release). July 2, 2013. Retrieved July 2, 2013. ^ "Thomson Reuters acquires startup options technology vendor" (Press release). August 16, 2013. Retrieved August 16, 2013. ^ "Thomson Reuters Acquires Majority Stake In Omnesys Technologies" (Press release). August 18, 2013. Retrieved August 18, 2013. ^ "Thomson Reuters Acquires Majority Stake In Omnesys Technologies" (Press release). September 16, 2013. Retrieved September 16, 2013. ^ "Thomson Reuters acquires the CPE and CPA Division of Bisk Education Inc" (Press release). September 10, 2013. Retrieved September 10, 2013. ^ "Thomson Reuters acquires Kortes" (Press release). November 14, 2013. Retrieved September 10, 2013. ^ "Thomson Reuters acquires Entagen" (Press release). February 4, 2014. Retrieved October 23, 2013. ^ "Thomson Reuters acquires Avedas" (Press release). December 10, 2013. Retrieved December 10, 2013. ^ "Thomson Reuters Acquires UBS Convertible Indices" (Press release). ^ "Thomson Reuters sells peHUB, Buyouts, VCJ to UCG". Retrieved December 26, 2017. ^ "Thomson Reuters Acquires K'Origin" (Press release). ^ "Thomson Reuters Acquires Business-integrity Ltd". ^ "Thomson Reuters acquired wm reuters foreign exchange benchmarks from state street corporation" (Press release). ^ "Thomson Reuters announces definitive agreement to sell its Intellectual Property & Science business to Onex and Baring Asia for $3.55 billion" (Press release). New York: Thomson Reuters. July 11, 2016. Retrieved July 13, 2016. ^ "Acquisition of the Thomson Reuters Intellectual Property and Science Business by Onex and Baring Asia Completed". ipscience.thomsonreuters.com. ^ "Thomson Reuters closes Redi acquisition". www.finextra.com. ^ "Thomson Reuters Completes Clarient and Avox Acquisitions". Thomson Reuters. March 20, 2017. Retrieved August 8, 2017. ^ "Thomson Reuters Completes Clarient and Avox Acquisitions Creating Best-In-Class KYC and Legal Entity Data Due Diligence Standards | DTCC". www.dtcc.com. Retrieved August 8, 2017. ^ "DTCC sells Clarient Global and Avox to Thomson Reuters » Banking Technology". www.bankingtech.com. Retrieved August 8, 2017. ^ "Blackstone to Buy Thomson Reuters Unit in a $20 Billion Deal". Bloomberg.com. January 30, 2018. Retrieved March 17, 2018. ^ Aycock, Jason (February 15, 2018). "Blackstone deal shows growing cracks between Thomson Reuters family, execs". ^ "Blackstone wins EU approval to buy Thomson Reuters unit". ^ "Thomson Reuters to acquire Integration Point". Retrieved October 23, 2018. ^ "Clinton Foundation donors include dozens of media organizations, individuals". Politico. May 15, 2015. Peter Kaplan (May 4, 2007). "Thomson Reuters deal would raise U.S. antitrust issue". Reuters. Penny Crosman (May 16, 2007). "How Will the Thomson Reuters Marriage Affect Customers?". Wall Street & Technology. CMP Media LLC. Ian Austen (May 9, 2007). "Combined Thomson Reuters Would Challenge Bloomberg". New York Times. Jerry Bowles (June 18, 2007). "Reuters using social media software to launch community around environmental markets". WebPro News. Archived from the original on June 5, 2010. Ovide, Shira (July 26, 2011). "Crunch Time at Thomson Reuters". Wall Street Journal. "CEO Glocer Is Under Pressure After Restructuring Backed by Controlling Family". Wikimedia Commons has media related to Thomson Reuters.